I’m a firm believer that salads are massively underrated in this country. We tend to stick to lettuce, cucumber and tomato, don’t bother to dress it and that’s it. Boring. No wonder people dismiss it as rabbit food. I’ve spent quite a bit of time over in California over the past year and my whole outlook on salads has changed. In true American style, Californians go BIG with their salads. 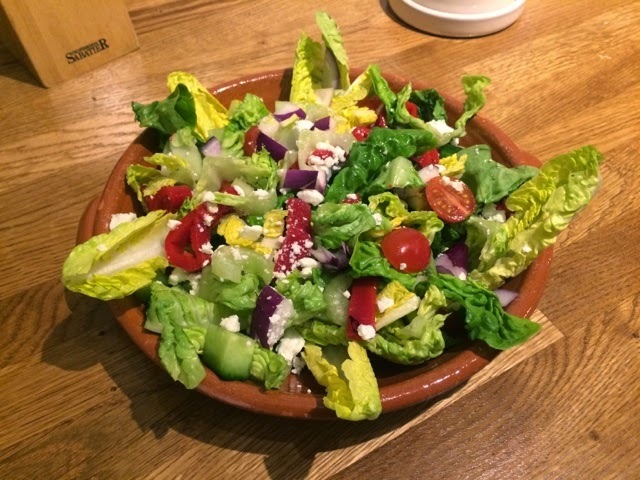 Whilst we Brits might dismiss this attitude when it comes to over stuffed sandwiches, giant burgers and pizzas piled as high as mountains with toppings, I really don’t think you can go wrong with this attitude when it comes to salad. The more yummy salad stuff you can squeeze in the better and the more colourful and exciting it looks, the more inviting it as and the more people will tuck in to eat it. Do be careful though, throw as many colourful veggies and even fruit in as you like but go easy on the dressings and the cheese, you only need a tiny amount and if you go overboard with the fatty ingredients, your salad could end up as calorific as a burger. Whilst I may have come home with more of an American attitude towards my salads, my ingredients in this instance are mostly Mediterranean. I often keep a jar of roasted red peppers in oil to hand as they come in so handy to throw into salads, pasta dishes or even wraps and sandwiches for an extra hit of flavour. If you’re not a pepper fan, sun dried tomatoes would be a good alternative. If you’re using up the last of the jar use this oil instead of the olive oil to dress you’re salad for extra flavour. Another tip is to go easy on the red onion, whilst I love the flavour, it is one that definitely tends to linger around and you’ll find yourself reaching for the soft mints later on if you over do it. I’ve not given exact amounts or a method for this one as all you have to do is throw it all together in the same bowl and you can adjust the amount depending on how much you’re serving. You might be making a small salad as a lunch for one or doing a large bowl as part of a buffet so I’ll leave it up to you’re own judgement.